What a weekend I had! I was super excited on Saturday, when mom and dad said we were going to visit some pugs in the south bay. I had no idea where the south bay was, but I do know hanging out in the car for a long time induces sleepiness. Once the car stopped and I wiped my eyes, I spied so many pugs! It was really cool to have this dog park filled with puggies to play with. I tried to go around and say "hi" to everyone, but not too many pugs were interested in playing with me. I still managed to have a good time just running around and did manage to play with some other dogs. Sunday was super exciting! Mom and dad said we were going to go and finally meet Puglet and Dutch! I was all giddy to finally meet them. So we drive over a bridge and got to this really cool park on this hill (hey it's SF, so a hill is going to be involved) and met with ooooodles of pugs. It was pug-topia. Now I know why mom loves Disneyland so much, this hill was my Disneyland!!! At first I had to stay on leash....mom was all worried I'd run off blah blah blah. Thank pugness dad took me off leash and the running began. 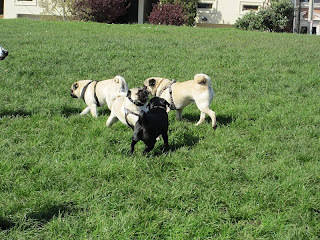 It was so exciting to play for hours with other pugs. 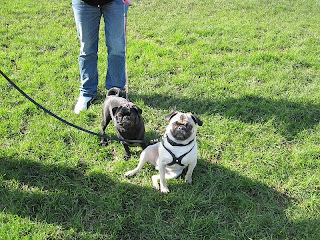 Mom seemed so excited to meet other pug owners, and dad kept a watchful eye on me. I was super happy to see my bestest bud Spencer show up, we had fun giving our moms heart attacks when we'd run away and not listen. The day got even better when Puglet and Dutch showed up! I've never had so much fun in all my life! Bellatrix! I had so much fun on Sunday! Wasn't it great to eat that nasty stinky mud and chase each other around? I love that picture of us...we are so cute together. My humans & I were so happy you & your humans were there. You finally got to meet Puglet, Dutch, and their human; aren't they super awesome? I got brave and chased Dutch around..hoping to win that chicken and show you how brave I am. My mom was such a killer though the way she kept following me around..and then she stepped in that mud hole and stunk all the way home in the car. Yeesh! Geez, I can't take my humans anywhere...Let's try to get together real soon! Hiya Spencer. I had so much fun running around with you too. Mom said her heart has finally recovered from me running around and down that hill. Sorry your mom stepped in something gross, mine just got muddy. I was so excited to meet all those pugs, and brother Dutch. "Talking pug" is one of my moms favorite things, so this was a happy weekend for her. I hope we can play together soon, mom says as long as it's enclosed she'll be happy! Glad you made it over to our PugSun! And thanks for making sure Dutch had a good time. Sometimes when I get around my people, I kinda forget about him. Hiya Puglet, Loved PugSunday even if it did scare my mom to let me run wild. I loved hanging with everyone, especially Dutch. I have some cute pictures with him, maybe I'll post them next.